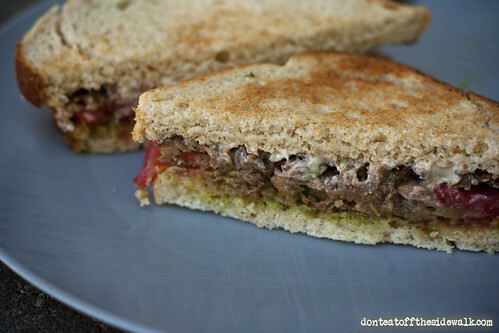 » Vegan sandwiches, get in my mouth. Don’t Eat Off The Sidewalk! Vegan sandwiches, get in my mouth. So after my cookbook lovefest, I got tons of offers pouring in for me to review cookbooks! Okay, not really. But months ago, I asked Celine if when her new book came out, I could get a review copy. Not just because I like free things, but because I knew it was going to be a winner. The vegan cookbook market may be a little saturated right now, but is there another sandwich book? I don’t think there is! And after knowing Celine online for years I knew i’d be getting interesting recipes and her gorgeous photos, and I was not disappointed. Here she teamed up with Tamasin Noyes, author of American Vegan Kitchen, which was her first book and has done amazingly well. One big concern that I did have was picky-husband-compatibility. My husband hates almost all vegetables and I find a way to make a vegetable that he will tolerate an average of once every three years. None of these are in raw form. Obviously sandwiches in general mean lettuce, tomato, etc. So before doing anything else, I immediately flipped through looking for Brian friendly recipes. Now if you have your own picky eater to serve your mileage may vary based on what they will and won’t eat (for instance, my husband likes yellow mustard, but won’t eat whole grain or any other ‘fancy’ kind), but there are plenty of sandwiches that have no raw vegetables, no veggies at all (like the Peanut Butter Banana Bacon Sandwiches), or it has mushrooms or avocado, which he does like. Relieved, I flipped back to the beginning. The tips section is short but sweet, mostly telling us how to keep the sandwiches travel-friendly. There is a short pantry list, half of it is stuff you probably know what it is (but any good cookbook assumes that this is someone’s first cookbook), the other half explains some less-familiar things like soy wrappers and maca powder. There’s also a list of the recipe icons. Onto the recipes! Obviously the bulk of the book is standard toppings-on-bread sandwiches, but that doesn’t mean they’re boring. There are classics that you would expect like the BLT, Reuben, and Meatball Sub, there are a ton of internationally inspired sandwiches. Many of the short recipe descriptions are a mini history lesson of these sandwiches from around the world, so the book is a good read, which is important to me. I think my favorite sandwich upon first sight was The Dagwood, which is inspired by Blondie and Dagwood! I also enjoyed that Celine and Tami’s husbands both got to design their dream sandwich for the book. I am only mildly offended that I myself wasn’t asked to put my dream sandwich in the book (j/k, j/k). There are smaller breakfast and dessert sections, some may not technically be sandwiches, but I am technically not ever going to disqualify an Oreo Wafflewich from going straight into my mouth. The last chapter covers some basic recipes, like three kinds of bread. I immediately recognized the cinnamon swirl bread from when Celine was going to put out a zine, I can’t say that it’s the exact same recipe but if it is, I can tell you that it’s awesome! There are also recipes for the various ‘meats’ used in the book. One thing that’s great is that not a single recipe calls for vegan mayo (that I could see). All of the spreads and dipping sauces are recipes in the book, and the recipes that have them are listed in the index in the back. Some people have an issue with any pre-packaged vegan substitutes in a book, I don’t as long as the bulk of the recipes don’t need them/they aren’t things you can make at home. I did see a recipe which calls for non-dairy cream cheese, but if you can’t get that at all there are many recipes on the internet and I think there might be a recipe in Celine’s past book, Vegan Substitutions. And finally, pictures: there are many. Not of every recipe and I didn’t count them, but they are by the recipe and not an insert in the middle. Celine took all of the photos and she has a really simple food styling…style. You can see some pictures from the book here. My only complaint about the book is that the recipes aren’t listed in the book contents or at the start of each chapter, but that’s easily solved by writing the page numbers of stuff I want to be sure to try on a sticky note and putting it on the inside cover. A very minor issue in a book that hits every other note: visually stunning, interesting recipes, good writing. As for what recipes I tried, not as many as I would’ve liked. For some reason, I got hit with really bad allergies this summer. I don’t remember most of August except as a blur of sneezes, no matter what I took or didn’t take. My time in the kitchen, or upright outside of work, was very limited for the last half of the summer. I picked the book up from the post office on my way home from work and fell asleep reading it on the couch. The first thing we made were the Apple Tempeh Triangle Dippers, which despite me making them very unphotogenic, were simple and delicious. Pepperidge Farms puff pastry is accidentally vegan, and the filling and pomegranate dipping sauce were super simple to put together. Tip: if, in your brain fog you forget that you have to defrost your puff pastry, you can microwave it, in very short bursts and turning/flipping it a LOT to move things along. I think I only microwaved mine for 60 seconds total, and managed to get it to a roll-able state but not ‘oops I cooked it in the microwave’. We also made the Peanut Butter Brownie Sandwiches (I keep saying we because even if Brian doesn’t directly help me, he still hangs out in the kitchen and hands me cups and stuff out of the pantry). Before reading the recipe I assumed it was: make a pan of brownies, cut into squares, insert filling between two brownies. 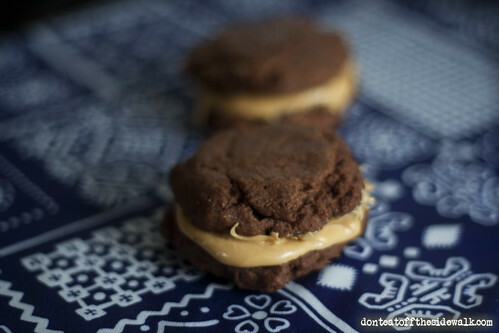 Nope, these look like whoopie pies, but they’re definitely brownies. I should’ve flattened mine more as the sandwiches were kind of tall, but oh my god. They are so good, and so easy to make. The peanut butter filling is thinner than a buttercream, but you can stick it in the fridge for a bit to firm it up some. These have non-dairy yogurt in them, which I know is pre-packaged, but I really like baked goods with yogurt in them. I like the texture it gives them. You can keep the brownie rounds in a baggie and the filling in a container and slap yourself together a little treat whenever you please, they keep for…well, we had eaten them all after four days, so four days. Vegan Sandwiches has been out for a hot minute, but fear not! You can still join the cool kids and order it from Amazon, Herbivore, or I guess you could venture out into the daylight and buy it from your local bookstore. Cheers!